Have a question about our on-premise email archiver? Is it possible to archive only email with Jatheon? Absolutely. Getting a standard Jatheon cCore appliance without add-ons for social media and mobile will let you do just that. You can unlock the additional modules at any time should the need arise. Why choose an on-premise solution? Although cloud-based solutions boast bottomless storage and flexibility, on-premise appliances offer some major advantages such as data security, integrity and availability, enhanced trust, ease of data migration and cost-effectiveness. What can be archived with Jatheon Archiving Suite? 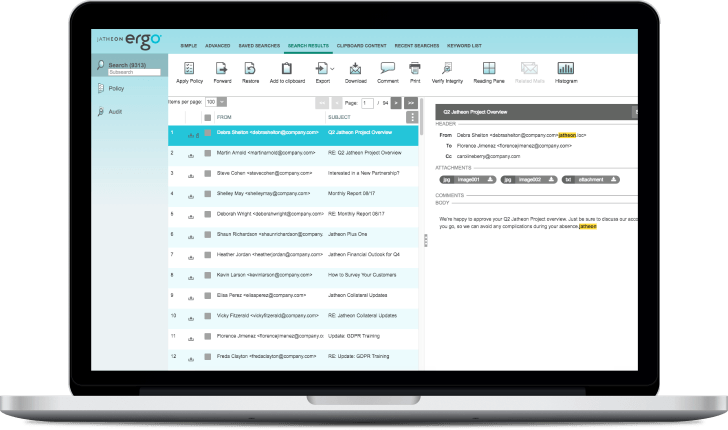 When we designed Jatheon Archiving Suite, we revolutionized information archiving by employing a new, modular approach. Many of our clients archive only email using our cCore on-premise solutions. You can, however, activate Jatheon CTRL, our optional module for social media and mobile archiving later. However, it’s not possible to purchase it separately, without already using cCore, our central, mandatory module. How is Jatheon Archiving Suite licensed? Jatheon cCore is licensed on the basis of flat cost per appliance regardless of the number of users. For Jatheon CTRL we use a simple, per account pricing. Jatheon takes care of importing your data and setting up your solution. There are no additional charges for either of these services. How much data can be archived with Jatheon solutions? Jatheon currently offers six appliance models with storage capacity that ranges from 5 to 66 TB. Our Xpand units let you add more storage space if the need arises. In case you need even more, we know some Jatheon people who’d be very excited to make a larger appliance. What happens after you buy the Jatheon cCore solution? Once you’ve received the appliance, our Support Team will get in touch and arrange a convenient time to do the initial setup, which normally takes about an hour. We’ll then migrate your legacy data (if any) and direct you to our Customer Portal. Whatever you need, remember that Jatheon Support is always a single phone call or email away. How is archiving different from backup and why backing up my data isn’t enough? Backup is mostly meant to restore files after disk failure or server issues and it can never live up to regulatory and eDiscovery requirements because files remain alterable. In archiving, files are stored in a WORM format, which prevents evidence spoliation and tampering with message content and metadata. Archiving involves a much more complex indexing system which makes your archive searchable and allows easy location of files.